Combining modernist cuisine with “tried and true” BBQ is no easy task. Figuring out how to fuse new world with old world techniques is a great challenge and one I took on this past weekend. Thinking through the best way to use my Sous Vide Supreme with a Brisket Flat has been on my todo list for awhile. Certainly cooking the flat using the sous vide machine would produce moist and tender brisket, but how would I get that traditional smoke flavor? Smoke it first then sous vide or the other way around? Well, this post will walk you through the process and report the results. 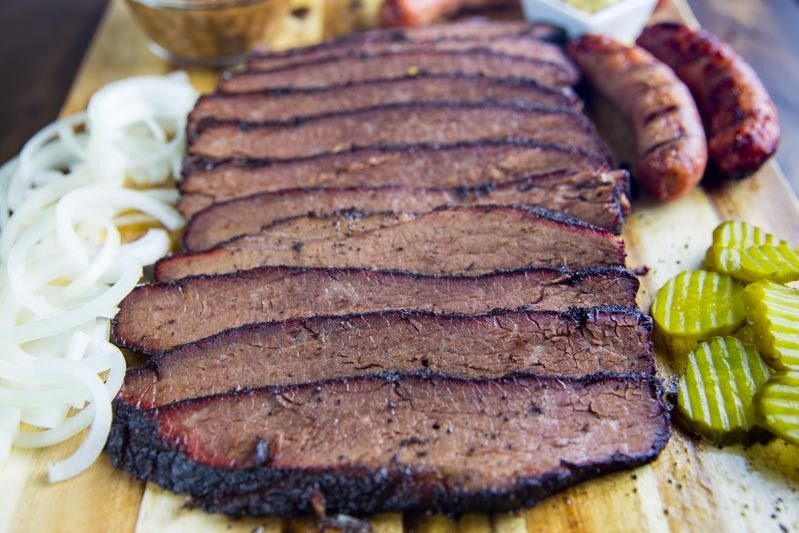 Now sit back, grab an ice cold Lone Star beer, and enjoy this post for Smoked Sous Vide Brisket Flat. One of my favorite food blogs is Serious Eats as they give the why along with the how to the recipes and techniques they post. One such article focused on cooking a brisket flat using a sous vide machine. In this article, they cooked the flat in the sous vide machine before finishing off on the smoker. I followed their advice and the recipe below was born. Trim the flat until you have 1/4″ fat cap on one side and the meat exposed on the opposite side. Cut the flat into two separate pieces so you can fit them into your sous vide environment. Pick your favorite rub for brisket and apply liberally to all sides of the flat. For this cook I used the new (and incredibly delicious) Fat Henry’s Classic Rub from Four41 South BBQ. Once the brisket flat is evenly covered in the rub, seal in plastic using a vacuum sealer. Preheat your sous vide to 155° and when ready, submerge the brisket inside. To get a traditional brisket texture let the flat cook for 36 hours in this environment. After 36 hours take the sealed brisket out of the sous vide and place in your refrigerator overnight to cool. When ready take the brisket out, reserve the liquid from the bags, and dry off the halves of the flat while you set up your smoker. For this cook, the Big Green Egg was set to indirect cooking, preheated to 250°, and filled with chunks of hickory and pecan wood for the smoke. In addition, there was a drip pan filled with water to help keep the environment moist. After 3.5 hours in the smoker, the brisket flat measured 185° internal temp, it had formed a beautiful crust, and was ready to get pulled. I let the flat rest under a foil tent for 30 minutes before slicing. The sliced brisket flat was served with some brats smoked along with this cook, baked beans, onions, pickles, and homemade BBQ sauce from the beef drippings. This recipe for Smoked Sous Vide Brisket Flat is a great way to fuse modernist cuisine with good old fashioned BBQ. This produces tender, moist, and smokey brisket! Wow, I’ve been itching to cook something sous vide and love to smoke meat. Might be time to pick up an Anova and get try this out – thanks for sharing! The fusion of smoking meat and sous vide is a fun journey! Lots to try and to learn. Let me know how it turns out for you. I’m getting ready to try a smoked sous vide brisket. I have done ribs many times with excellent results. I’m smoke for 3’hours at 225 and then sous vide for 16-24 hours at 155. I then glaze with sauce on grill or under broiler for a couple of minutes. Great flavor and super tender. I’ve seen a lot of sous vide brisket tutorials and this is the only one that looks like central Texas brisket. Looks fantastic.. I’m curious if you’ve had a chance to try the smoke>sous vide>smoke yet to impart more smoke into the meat? No I haven’t and good catch. Now I’m motivated to do this… Thank You! Why use the sous vide method when you are going to cook it for 3hrs at much higher temperatures to finish? Genuinely curious. Thanks! Simple answer is to slowly render the fat in that tough cut of meat. This essentially braises the meat from the inside out. After your sous vide the brisket flat you finish it off on the smoker to get that true BBQ flavor. I’m about to try this and I just realized it said to cool brisket overnight. Is that part necessary or can it go straight on the smoker to finish? It can go right in to the smoker to finish! It sure can! I loved how mine turned out. I think I crushed it and I can’t wait to cook another one. I’ve posted a link to the picture of my finished product. Check it out. What temp did you do for 24 hours? Same 155?